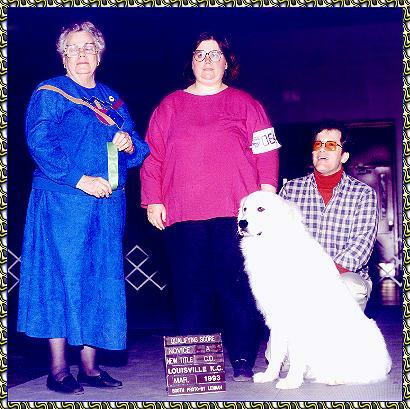 KeePlay Kees and PyrPlay Pyrs got its beginning in 1990 when Lance gave Debbie a Great Pyrenees puppy (Andorra's Broadway Debut CD CGC TT) for a wedding present. Our initial interest in purebred dogs was in the field of obedience, and we soon learned that Great Pyrenees weren't exactly the obedience dog of choice! Our first keeshond CH Ashwood's Let It Ride for Copykee CGC TT (Dice) was purchased from Donna Staton with obedience in mind. Somewhere along the line our interest turned to conformation and there's been no going back!! Our "Play" kennel name came from our interest in the theatre. Before the dogs came into our lives, we were very active in the theatre in the areas of directing and acting. All of our litter names contain play titles. We are currently active in both breeds but have enjoyed more success with the keeshonden. To date we have finished five homebred champions and have four more pointed. Although we have had Great Pyrenees for eleven years, our first litter has only recently arrived. We have finished several dogs to their championship, but various health problems prevented breeding because we only wanted to start with the best!! We are located in Elizabethtown, Kentucky, 40 miles south of Louisville on I-65. Our philosophy about breeding is simple - No puppy asks to be born. We are playing God when we have a litter; consequently, we are responsible for those puppies for the rest of their lives. All companion animals are sold on a spay/neuter contract. An extensive puppy packet is provided which includes copies of parental health test. We welcome novice show exhibitors and will help you as much as needed!! Quality is very important to us. We are members of the Keeshond Club of America and the Great Pyrenees Club of America and follow the Code of Ethics of both clubs.